Lori Bruno is a Hereditary High Priestess and Elder of the Sicilian Strega line of the Craft of the Wise, founder and Head Mother of Our Lord and Lady of the Trinacrian Rose Church, Inc. The church was founded in 1993 and is based in Salem, Massachusetts. When Lori was born in 1940 she was born into one of the last lines of Oral Traditional teachings in which are handed down from generation to generation through the family. Lori was born into a line of Ancient Dream Prophets out of Sicily and her family was known throughout the entire Mediterranean region for their magical and healing abilities. The family resided and is from the slopes of the ancient volcano known as Mt. Etna, not far from where the City of Catania stands today. Lori is a descendant of Gohar – al – Siculi, a General in the Fataniid Empire, who in A.D. 969 was sent by the caliph of Baghdad to conquer Egypt. This he did and founded the city of Cairo, Egypt. As the stories were handed down in her family, General Gohar became a convert into Islam. Donna Marietta reportedly healed plague victims by using Arabic medical texts as handed down in her family for many generations. Donna Marietta also had a magical knife made of fine Damascus steel (a surgical instrument) that she used to open and drain the pustules of the plague victims. She was the only one who could cure anyone of the plague. Marietta paid for her beliefs with her life, another senseless murder by the Vatican, she was burned alive and her ashes taken up into the wind that blew over the Sacred Island of Trinacria the original name for Sicily which means “three capes”. The winds swept over the island of Demeter and Persephone, and into infinity. Marietta’s beliefs survived and were carried down throughout the generations by her descendants. These are some of the stories Lori’s father had handed down to her concerning his side of the Family, who came to a free land, America in 1913 (the same year that Giordano Bruno was written-about by Annie Besant). Along with the family came the “Old Religion” from the Sacred Olive Groves to the land of the Mighty Oaks. On Lori’s mother’s side there were people of the Old Religion as well, they came to America in the 1890’s. Lori’s maternal Grandmother, Zia Victoria (Aunt Victoria), was a midwife in the area of New York City, known as “Little Italy”, their family came to New York from an area of Central Italy known as Naples and Nola, from this side of the family; they too spoke orally of the ancestors, the Priests and Priestess of the Old Religion. Later in the 1970’s Lori met Dr. Leo Louis Martello and they formed a lifelong and infinite friendship, Leo himself a Sicilian Stregone, High Priest residing in New York City. Leo was a man who fought for the rights of people and for the Pagan Community and from that effort organized and won the right to hold the first “Witch-In” at Central Park, NY on Samhain 1970. This was indeed a great Victory for the Old Religion as well as for all Pagan’s around the world. Leo Martello became Lori’s mentor, best-friend and was a true Soul Mate. To this day she honors and remembers him by celebrating his life daily and reminding all of us, her family what it really means to be a WITCH. Leo was an Honorary Elder of Our Lord and Lady of the Trinacrian Rose Church which is a legally recognized religious body in the Commonwealth of Massachusetts, which was founded on the 400th Anniversary of the heresy trial of Giordano Bruno. In addition to Our Lord and Lady of the Trinacrian Rose Church, Lori has also founded the Sacred Paths Alliance Network (SPAN) a charitable efforts organization, and the Protective Order of Witches and Earth Religions (POWER) in 1995 for religious freedoms. SPAN is a charitable organization which gives 100 percent of all monies raised to various charities, which have included the Hospice at Mission Hill, Children’s Aids Program, and others. On the 29th day of June, 2000 Dr Leo Louis Martello passed over and returned home to the Sumerland, and from this Leo got his wish, to see Lori write. The first thing she wrote was his biography for Llewellyn’s 2002 Magical Almanac. Lori is the Sole Heir to Leo’s works and holds all copyrights on his works both published and unpublished, recently she, with the assistance of others, have been issuing Cease and Desist orders on persons throughout the internet who were either selling or giving away Leo’s work without prior permissions. From this Lori’s has collected all titles and dates to when they are protected until listed on Leo’s bio page on her website. Lori wrote, “Leo’s light will never be dimmed his light burns brightly forever within the hearts of his Coven family.” Indeed, in Lori’s home, a light is perpetuallymaintained for him as well as for her entire family and elders. The perpetual light is a tradition that is honored by Italian Witches to show respect for those who have gone home to rest in their Sumerland of the Shadows until they are once again re-incarnated. In 1996, Massachusetts Governor Michael Dukakis presented Lori with an award for the “Protection of the Children of the Commonwealth,” which hangs proudly next to her at her shop, Magika, today. As is tradition over thousands of years, the family Black Stone was handed down to Lori it is known as the “Heart of the Mother” by the Elder Priestess of her family. Lori feels that the fact she comes from a family of hereditary lineage does not make her better than people who are seekers. She truly feels that new seekers are Old Souls coming back and remembering their roots. Lori feels strongly that hereditary practitioners cannot live off of their ancestors’ accomplishments and they must make their own way and keep the light of the Gods forever bright. Lori maintains that whether one is Celtic, Germanic, Slovak, Greek, Italian, Sicilian, Oriental, or from whatever nation you are origin-to, that we are all brothers and sisters. This is how Leo felt as well. She states we must work together toward Peace and Understanding, for we are Humanity. Many years ago Lori was asked about the meaning of “Witchcraft”, Lori then took the very word WITCH and said the following; W is for Wisdom, I is for Integrity, T is for Truth, C is for Courage and H is for Honor. Lori was taught that Priests and Priestess should respect humanity, all living creatures, and above all, one’s self as the Goddess and God abide within. Lori states that the Gods see us “naked” whether skyclad or robed, and see down to the exposed soul itself. The Gods are the final judgment, whether one is hereditary, seeker, High Priest, or High Priestess. They know each person and each Heart. Lori says that in Ancient Egypt, the only organ left in the mummy was the Heart. To the Strega, that iat the “all.” Without that heart fire, one’s magic is nothing. These lessons were instilled in Lori from a very young age and she has lived her life accordingly. Lori has two children and four grandchildren, a wonderful coven family, any many dogs. She believes that no matter what difficulty life has placed before her, her strongly beliefs the Goddess and God have seen her through it all. She sees the future with more and more people coming into that strength of freedom with love surrounding all of life on this planet and the universe, where all religions that respect all of creation can live in peace together and create peace for humanity. 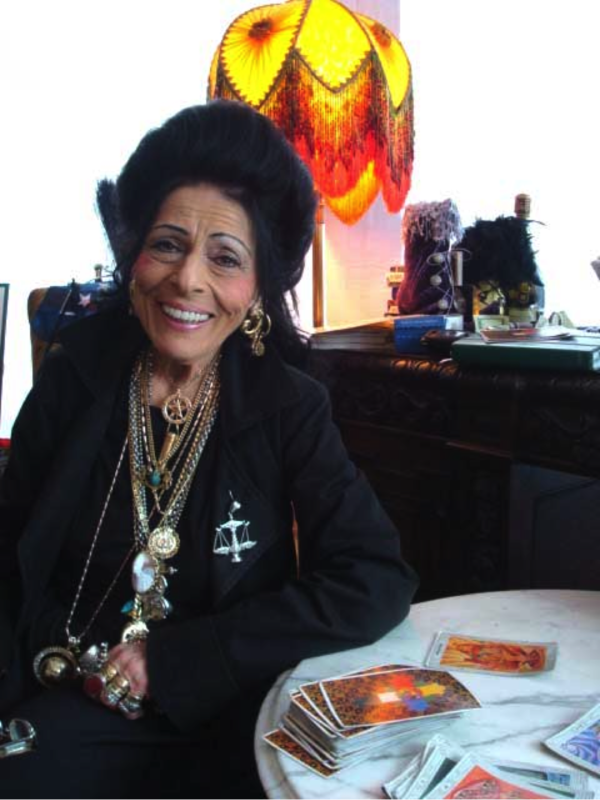 She has appeared on television, radio and has appeared in print throughout the United States and Canada, lecturing about her Craft so that others may learn form her, and conducting private psychic consultations. She has also worked, free of any monetary compensation with families who have suffered loss of family members, missing due to criminal activity, and those loved ones who have passed over to the Other Side.